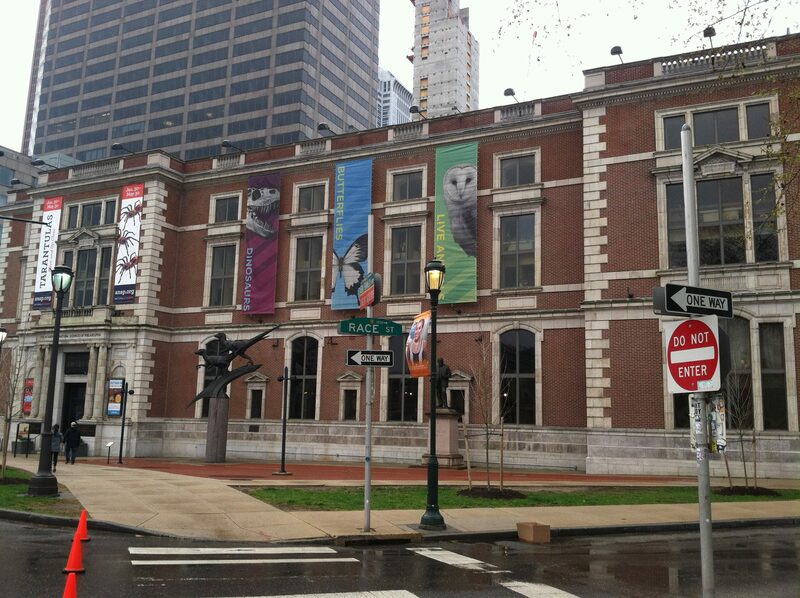 The oldest of its kind in North America, the Academy of Natural Sciences (of Drexel University) is a natural history museum founded in 1812, originally located near 3rd and Market in Old City. It was moved around several times until moving to the southern border of Logan Square, in a building designed by James Windrum, who also designed the Masonic Temple. The Academy was purchased by Drexel University in 2011. It’s location puts it at the heart of the parkway, where several other major sites are a short distance away. Like most natural history museums, dinosaurs have a major presence here. 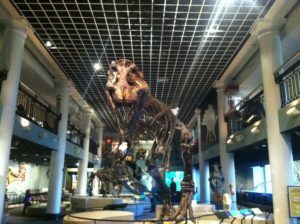 Dinosaur Hall is at the front of the building, where Tyrannosaurus Rex dominates the center of the room. There are several other dinosaurs around the room, including a tylosaurus, an aquatic variant. There are also other models of dinosaurs on display, such as the internal anatomy of a stegosaurus. For little kids, the Big Dig is in the mezzanine, where children can learn about the process of finding fossils, and dig for some “fossils” of their own. Another part of Dinosaur Hall contains a green screen, where you can simulate being in a dinosaur world, Jurassic Park style. Aside from that, there’s the Butterflies, which is one of the more well known exhibits at the Academy. Visitors can observe live butterflies, which are placed in a heated habitat similar to their natural environment. These butterflies do around the room, and also can land on visitors, so be wary of that. They can also be found on the floor, so be careful. Aside from that, it’s a nice way to learn about these beautiful creatures, as well as the plants that they live on. There are the North American, African and Asian halls, which display various animals in their natural habitats. In total, there are 37 dioramas. It’s a staple of natural history museums, and therefore is present here. North American Hall includes bears, bison, and moose. One interesting piece is “Frankenmoose”, which has exaggerated antlers that were not originally attached to that particular moose. The African hall includes the Serengeti, with lions, zebras, gorillas, and more. An Egyptian mummy can also be found here. The Asian hall has tigers, pandas, and yaks, among others. On the third floor, a diorama of the extinct passenger pigeon is part of an exhibit highlighting the destruction of ecosystems. Admission is $18 for adults, $14 for children, $15 for military and seniors, and $10 for Drexel students. This also varies, with prices higher on weekends. The Academy also houses several events, which usually take place in the auditorium, located behind Dinosaur Hall.